Sean Spicer was asked about Melissa McCarthy's 'SNL' impression and tried so hard not to look mad. 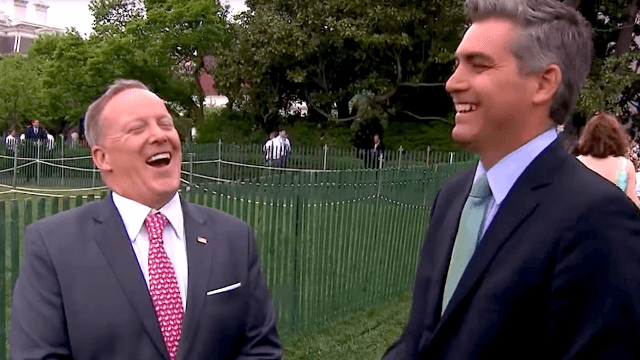 During Monday's White House Easter Egg Roll, Press Secretary Sean Spicer took time away from reading from kids (which the president is supposed to do, but whatever) to speak to CNN's Jim Acosta. Acosta couldn't pass up the chance to ask Spicer what he thinks of the purple-faced, screamy impression of him that Melissa McCarthy keeps performing on Saturday Night Live. In the spirit of the day, Spicer tried to be magnanimous in his answer, but it's easy to see he hates these sketches more than he hates spitting out gum. At least he wasn't wearing the bunny suit this time.